Most people know that Santa Claus is derived from Saint Nicholas, but who exactly was Saint Nicholas, and how did he become the old gentleman with a white beard, dressed in red and white, who appears at Christmas? There was a certain poor man in Myra who had three daughters. This was an affliction to him, because he was too poor to provide them with dowries, which meant no-one would want to marry them, and the only solution he could think of was to sell them as prostitutes. Nicholas got to hear of it, and to save them from this fate he secretly dropped three bags of gold through their window at night, to provide them with the necessary dowries. He thus became associated with the giving of gifts, and his sign was three money-bags, or balls of gold. But Nicholas is now known as Saint Nicholas of Bari, which is in Apulia in south-eastern Italy, a long way from Myra. How could this be? What happened was that in 1087 the city fathers of Bari decided their city needed a tourist attraction to bring in the punters and raise necessary revenue; and in the Middle Ages this meant the relics of a famous saint. So a party of grave-robbers was sent to Myra, and succeeded in taking Nicholas’s remains from their tomb. The sweet smell that arose from the opened coffin told them that the saint was happy about this! The robbers conveyed his body back to Bari, where it was entombed with great splendour. The whole project was a tremendous success; pious pilgrims flocked to Bari to worship, and the city became immensely prosperous as a result. But the city fathers double-crossed the grave-robbers, and refused to pay them the reward agreed for their work! But how did Saint Nicholas of Bari become Santa Claus? Nicholas’s feast-day was December 6th, and it became a day for giving presents, so it is easy to see how this was postponed for a few days until Christmas. As for the name: this is Dutch in origin, derived from the early Dutch settlers in New York (originally New Amsterdam), where Saint Nicholas in the local dialect became “Sinte Klaas”. There is no doubt that Santa Claus is an American importation, and did no reach Britain until the late 19th century at the very earliest: there is no trace of him in Charles Dickens, for instance. His reindeer all have German names, and his costume of red robes trimmed with white fur only become standardised in the 20th century. Why red and white? The widely accepted answer is; because they are the Coca-cola colours! 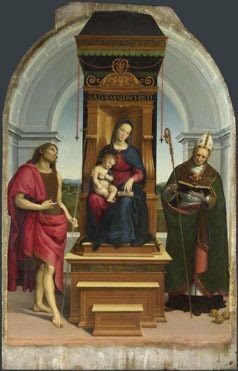 The above picture is an early painting by Raphael, known as the Ansidei altarpiece, which can be seen at the National Gallery in London. The figure on the left is John the Baptist, but the bishop on the right is Saint Nicholas of Bari! This is not Santa Claus as we are used to seeing him! As they might say on Star Trek: "It's Santa Claus, Jim; but not as we know him!"